9,753 people were recording living in emergency accommodation in December. THE NUMBER OF people living in emergency accommodation dropped in December, but Minister for Housing Eoghan Murphy has said this number was “anticipated given the time of year”. Emergency accommodation figures for December show that there were collectively 9,753 people living in emergency accommodation across Ireland, a drop of 215 people when compared with November. The vast majority of these are in Dublin, and include families living in hotels. The number of homeless adults rose by 37 in December to 6,194. Despite the rise in adults presenting as homeless, the Department of Housing noted there was a decrease in the number of families accessing emergency accommodation nationally with 111 fewer families, including 252 children. For the fifth consecutive month, the number of families presenting to homeless services in Dublin has decreased. 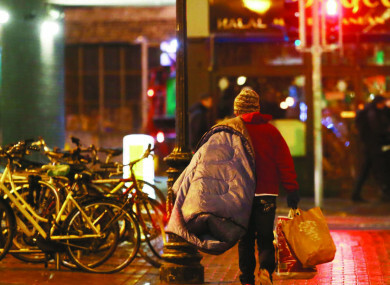 In December, 70 families were prevented from entering emergency accommodation in Dublin. Commenting on the figures, Minister for Housing Eoghan Murphy said that the increase of adults accessing emergency accommodation last month “was expected given the large numbers of new beds introduced for rough sleepers in the Dublin region”. “These individuals are now receiving the care and support that they need to exit homelessness to an independent tenancy,” he said. Sinn Féin housing spokesperson Eoin Ó Broin said that he welcomed any reduction in the number of people homeless, but said this was a result of the “usual annual seasonal drop in the number of families with children that occurs every Christmas”. Yesterday, the Dublin Region Homeless Executive (DRHE) urged members of the public to report anyone sleeping rough in the capital as temperatures plunge over the next few days. A Status Yellow weather warning issued by Met Éireann kicked in at 6am yesterday morning and will remain in place until 6pm on Saturday. It was announced in November that the DRHE was to make 333 extra beds available this winter as it aims to meet a rise in demand for its services during cold weather. Email “Over 3,500 children in Ireland were homeless for Christmas in 2018”. Feedback on “Over 3,500 children in Ireland were homeless for Christmas in 2018”.